Are you a couple? Do you prefer to have a guide all to yourself? Consider our private Marrakech Tour. The circuit is similar to the group tour, but with a smaller number of people, so we can make the most of the Medina neighborhoods. Our circuit begins in the district of the Hivernage, the first residence of foreigners in Marrakech. We cross the new town of Gueliz, with two buildings of remarkable architecture, the Royal Theatre and the railway station. We continue along the famous walls, passing the legendary Mamounia Hotel, crossing the garden of Agdal and penetrating the closed area of ​​the Kasbah. Arriving at the old Jewish quarter, we take a break at the metalworkers place. Finally the narrow streets lead to the famous Jemaa El Fna. We continue to Gueliz through the Bab Doukala door and finish at our base Tarik Ben Ziad street. 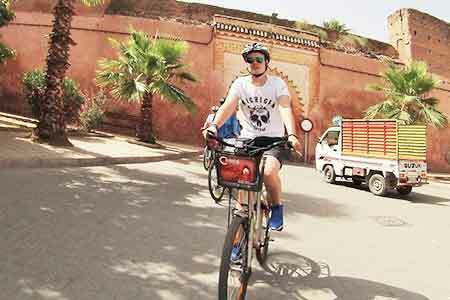 This circuit is ideally suited to urban bike safety and brings you closer to Marrakchi life for an original tour of Marrakech.